Cloches are transparent, temporary covers used to enclose a section of garden in order to modify plant growing conditions. The word, “Cloche”, literally translated from French means “Bell”. 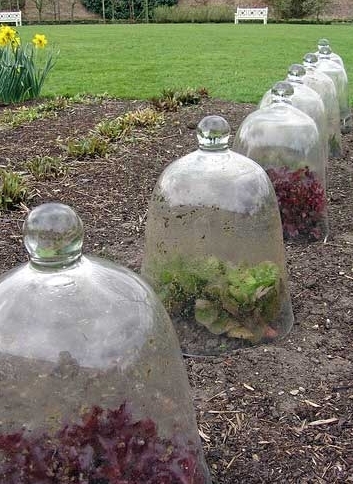 At one time, cloches were literally, bell-shaped jars used to cover plants. It is interesting to note the use of recycled soft drink bottles now used for the same purpose. Cloches, like greenhouses and cold frames, extend the growing season and are useful in cool and cold climates where wintry conditions extend into spring. Frost tender plants can be retained for the following year by cutting them back and placing them in a sunken cold frame for the winter months. Plants may not continue to grow, instead they will undergo a mild dormancy and be ready to resume growth at a more advanced stage, when temperatures are high enough for processes to start. Pot the plants in containers and pack them as close together as possible. A tight mass will be less vulnerable to low temperatures. Water well and cover the soil with mulch for added insulation. 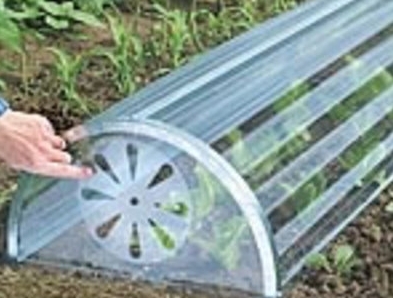 Cloches are more commonly used in the vegetable garden, though, that does not exclude protection for tender ornamental plants and seedlings that would benefit from extra protection. 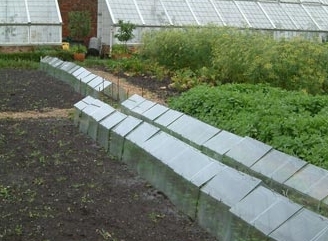 At the end of winter, a line of cloches can be placed in a row on cultivated soil some days before planting. Root vegetables that do not tolerate transplanting and are best sown directly, like carrots and radish can be started earlier with a greater assurance of success. The sun’s energy warms the soil under the cloche drying it so that it can be easily worked to a tilt. Seeds are planted and watered and the cloches replaced. The higher temperatures and protection inside the cloche will result in a higher rate of germination. As the seedlings strengthen and the weather warms, the cloches can be removed. Cloches permit earlier planting of seedlings started indoors. Used in these ways, crops can have a few weeks start and produce a crop correspondingly earlier. Glass, as always, is the best material. It transmits light well, is rigid and warms the soil rapidly. Clear plastic is much less expensive but has reduced light transmission and heat retention. It is less likely to break but should be treated with an ultra violet inhibitor. Twin walled polycarbonate retains heat well. End pieces are important, without them, cloches are useless and they should be draughtproof. Tent cloches are the simplest kind, made from two sheets of glass clipped together and are useful for germinating seeds and plants in their early stages. A tunnel cloche is made of rigid or flexible plastic stiffened with semicircular hoops, is cheap and easy to move around. Barn cloches are made of four sheets of glass, have almost vertical sides and can be used over a long period, allowing plants to grow tall. Watering is a problem and some cloches can be fitted with a sprinkler system, others are self watering, allowing rainwater through to the plants below.